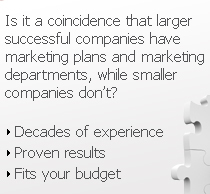 A marketing plan drives the company success and not vice versa. The chance of success without a marketing plan are very slim. Unfortunately the thought of creating a marketing plan can strike fear in the heart of the toughest executive. Companies don�t have the time or the knowledge to create a plan. We have dealt with companies that have admitted a plan would they have to complete projects on time. They were scared of the accountability that would actually bring them success. �The internet doesn�t work� is a complaint we hear all the time from companies. It is interesting that the complaint comes from the very same individuals that order books on Amazon, download music on iTunes, watch the latest funny video on YouTube and Google the recipe for next Sunday�s dinner. If the internet didn�t work the complainers competitors wouldn�t be on the first page of the Google results and capturing business. In fact, wouldn�t the first page of Google be blank? The problem is that the company website has not been built and promoted correctly for it to be visible to surfers while searching. In general if a website is not listed on the first two pages of the search engine the company is invisible and cannot be considered by the surfer. Most surfers will find what they are looking for on the first page. Would it make difference to sales if your website was listed on first page of Google or Yahoo! in the natural listings? If so, we can get you there! You may not be in the Pizza business, but the following make strike a chord for your industry. They know a small percentage will respond to the offer and redeem the coupon by visiting the restaurant or call in an order for delivery. At the end of the promotion they count up the number of coupons redeemed and determine whether or not the direct mail campaign was a success. It is safe to say these campaigns do work, because a slightly different offer is in your mailbox next month. Mission accomplished! Or is it? Let�s drill down a little further. For the sake of discussion we will assume that the restaurant direct mailed 20,000 coupons to local residents and businesses and a modest 1% were redeemed. That�s 200 groups visited the restaurant and presumably enjoyed the food and had a good time. The restaurant has no idea who their paying customers are or how to reach them again except by paying for another direct mail campaign. When was the last time you redeemed a coupon and were asked for your basic contact information? Once? Never? Restaurants are paying over and over again to get the same customer back, and then complain about the high cost of advertising. Wouldn�t it be cheaper in the long run for Pizza Restaurants to grow a database and email coupons out to existing customers? In their case, and yours, we will develop mechanisms to capture a database of potential customers so that you only pay for the advertising once! We have seen samples of press releases created by companies and advertising agencies that have absolutely no chance of ever being published. What is the point of putting time, effort and money into creating something that will never be read by anybody else. The biggest reason that press releases are never published is that they lack relevant and timely content that will be informative to the target audience. As we have never issued a press release that has never been published we can do the same for your company. We have all heard about six degrees of separation but what does it mean? The theory refers to the idea that we are all connected to anybody else on the planet through a trail of only six people. At first blush this concept may appear impossible, but give it a thought for a few moments. It�s all about who you know and then who they know. We are sure you very well connected in your industry, as we are in ours. Among our �degrees� are the media, celebrities, politicians and corporate executives.